I've always loved the Simpsons, even through the tough years. Even in the very worst seasons, there was always one highlight for me - the Treehouse of Horror episode. You have no idea how PO'ed I was last weekend when this year's episode was delayed due to the baseball game. Playmates and Toys R Us did a terrific job with the THOH themed playsets, and now Mcfarlane Toys has produced their fourth. They started out with the mediocre Ironic Punishment set, and improved with the series 1 "The Belly of the Boss", but that was just a warm up to the much nicer Island of Dr. Hibbert set. 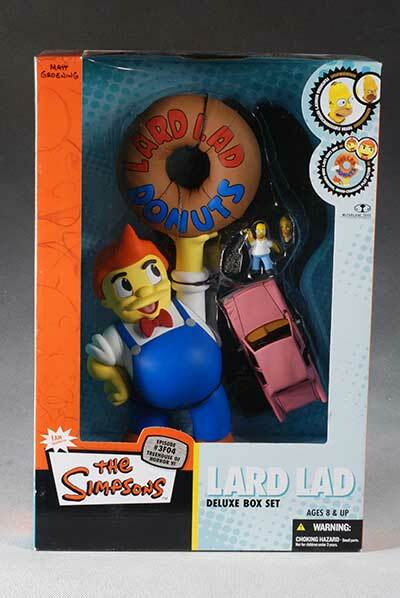 Now the Lard Lad set is hitting stores, one of the 'deluxe' sets. This set is from the start of THOH VI, and the segment Attack of the 50 Foot Eyesores. In this particular scene, Homer is preparing to steal the donut from Lard Lad, before the freak storm that brings him and other advertising giants to life. 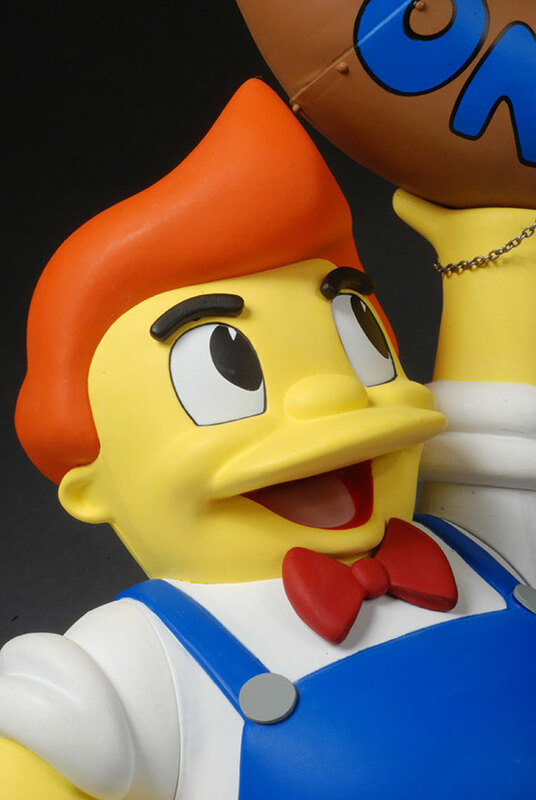 BTW, this isn't the first time we've seen Lard Lad in toy form - an woefully undersized version was part of the World of Springfield Main Street playset from Playmates. The box does the job, keeping everything safe and sound. It also does a great job showing of the Lad at least, and is fairly easy to store if you're a MIBBer. The sculpting of the characters continues to be top notch, even in this scale. I wasn't thrilled with the work on the recent Grinch deluxe set, but we get quite a bit more here with the huge Lard Lad. 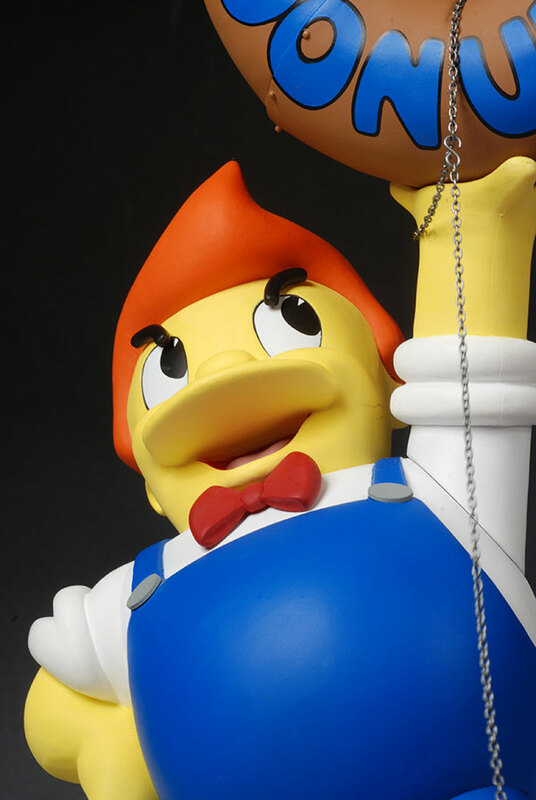 He stands about 8 1/2", although the full set is about 12" with the donut above his head. In person, it's quite impressive, much more so than the aforementioned Mount Crumpit. The sculpt detail here also fits a bit better with the less complex style of animation. There's far less to the appearance and expressions on Homer than there is with Grinch, and that means it translates a bit better to this smaller scale. Homer is just about 2" tall, but you'll know it's Homer just the same. His ears are a bit small, and his nose seems a tad bent, but considering the size it's not too bad. Scale here is much better than usual, and at least as good as in the cartoon, where the size of Lard Lad tended to vary from scene to scene. Another nice touch for this category is the use of the real metal chain, rather than going with a plastic substitute. This also allows them to use a much smaller link, making the chain appear properly in scale to the car and to Lard Lad as well. The set pops together fairly easily, but take some care putting Lard Lad on the base. You have to get his feet in the right spot to avoid damaging the base, and to make the action feature work properly. The fine chain is actually in two parts. 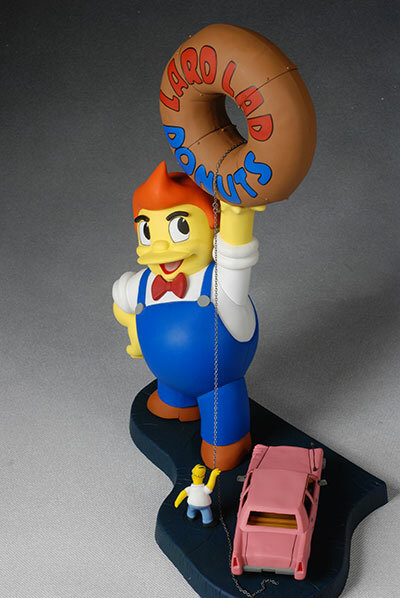 One part is permanently wrapped around the donut, while the other part is permanently attached to Homer's hand. There's a small hook on one end of the long chain to attach it to the looped chain, and this works quite well. My one complaint in this category is that Homer is looking downward, rather than up at the donut. Considering the pose and the scene, it doesn't make much sense for him to be looking down at the ground. The paint is quite clean all around, so I think it's safe for us to proclaim that Mcfarlane has the paint issues with the cartoon lines under control. Cut lines are clean, and colors are nice and consistent. Unlike the animated Spawn line I looked at earlier this week, there's none of those annoying rub marks on the finish either. But if I were purely going on basic paint quality, I probably only would have gone with three stars. It's not that there's anything major wrong here, but let's face it - this is some pretty basic coloring to get right. Even a mass market toy ought to be able to pull this off, and these are really specialty market at this point. The thing that bumps it up another half star for me is the darkening of the face and head that they did for the 'masked' version of Homer. It doesn't sound like it would work, but it does, much better than I thought it would. You get the impression of a stocking over his head without them trying to overdo the detailing. I'm giving the set extra points here, since play sets are rarely 'articulated'. 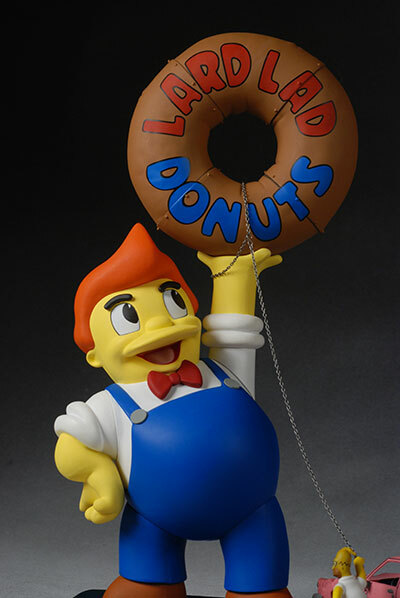 In fact, Lard Lad himself is more articulated than the included Homer figure. Since the head can be swapped, it should be no surprise that the neck is a cut joint. And since this is a Mcfarlane 'diorama', then it should be no surprise to hear that's it for him. But Lard Lad has cut shoulders and articulated eyebrows. Unfortunately, only the right shoulder is poseable, with the left shoulder and eyebrows designed to only move with the action feature. But that's still more articulation than I expected to see. I suppose how you score this category depends on what you call an 'accessory'. 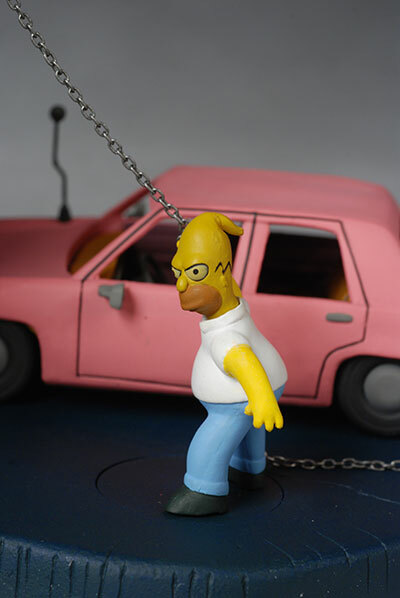 I'm lumping all the core pieces of the set together - Lard Lad, Homer and the car - since the diorama really isn't complete without them. 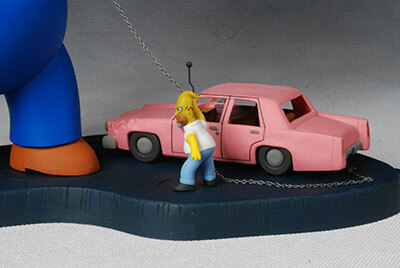 Even then, this set does have an accessory in the extra head for Homer. It's done in the stocking cap look, and actually works quite well considering the design. It's a nice inclusion, and for me, any score in this category is a plus to the overall since most 'dioramas' like this don't come with many accessories. Pull down on the donut, as if Homer is stealing it, and the arm moves downward and the eyebrows turn downward in a scowl. There is a small lever on the left side (or right side, facing you) of the play set. Push this lever, and LL's left arm tilts down, as though HOmer is trying to get the donut free. At the same time, LL's eyebrows tilt inward in a mean expression. 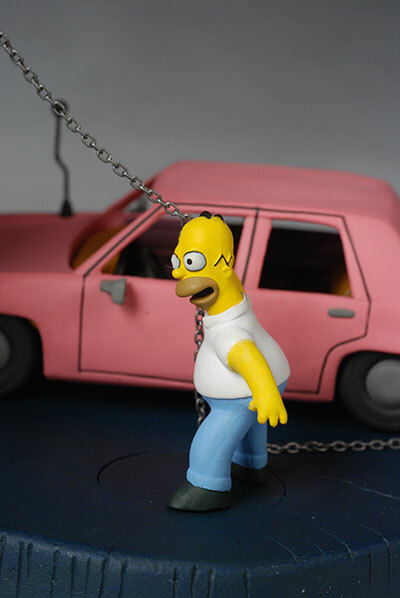 Homer also turns his body, as though he's the one pulling the arm down, but that's not the case - no pressure is put on the chain at all. That was a smart move, since it would be easy to damage the chain otherwise. The eyebrows tilt too far though, ending up at perpendicular to the ground. In direct contrast, the arm doesn't tilt very far at all. This is not nearly as lame of an action feature as the now much abused Mount Crumpit, but it still doesn't do a whole lot for me. I suspect that the requirement for these goofy action features is coming from FOX, who probably still think kids are the audience for these sets. 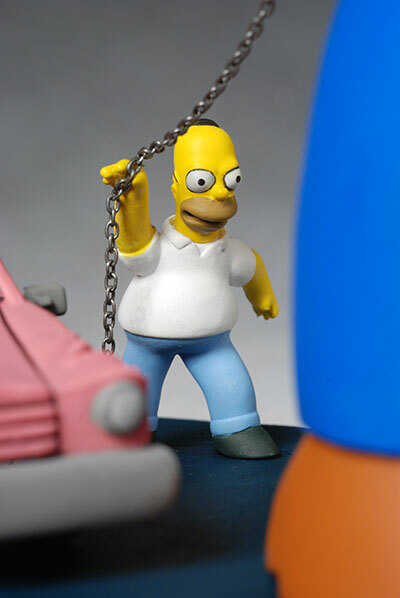 I would have preferred simply giving us articulated eyebrows that we could pose, so he could be scowling at Homer all the time, rather than only when you're pulling on the arm. This isn't really designed as a toy for kids, but then despite what FOX always thought, neither were any of the Playmates action figures. Big fans of the show will like this set, particularly for their Halloween display. If you can manage to snag this set closer to $20, I'd add another half star. It's not quite as good of a value as the Dr. Hibbert set, but Lard Lad is still one might big figure. The inclusion of the extra head for Homer also adds to the value for me. But if you pay closer to $25, then you're getting a fairly average value for your money. Not much. The action feature moves pretty smoothly, and the Homer heads pop on and off pretty well, especially considering the scale. If you're a big Simpsons fan, that I recommend picking up the set. Obviously the scale doesn't match up with any of your other lines, but you could use some of the small PVC's that we've gotten in year's past if you'd like to fill out the cast of characters a bit. It's not a perfect play set, but it's decent work. My biggest issue is that it really isn't all that horrifying. 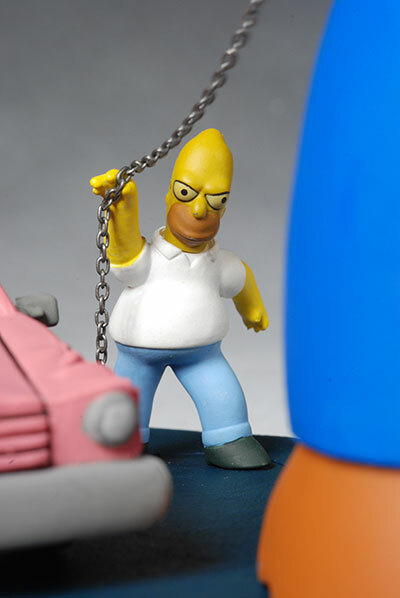 When Mcfarlane got the license for the Simpsons, I was hoping we'd get to see some stuff that Playmates couldn't do, stuff that was more gruesome or violent, like some of the possible Itchy and Scratchy concepts or even more disturbing THOH ideas. We have been treated to the two I&S sets which were good, but the rest of the series (including the four THOH concepts) have all been notably soft core. The tremendous potential just seems wasted. Ah, but we will be getting at least one more THOH set in the second series, based on "The Raven", a set I always wanted to get from Playmates. It might not be cutting edge, but at least it will be a fan favorite. - Amazing Toyz has him in stock for $23. - CornerStoreComics has the set in stock for $23 as well.